Periodontal diseases are infections of the gums caused by insufficient oral hygiene and the accumulation of dental plaque and bacteria. Periodontal infections include gingivitis and periodontitis. Gingivitis is the first stage of periodontal infection involving only the gums. Gingivitis is reversible and easy to treat. 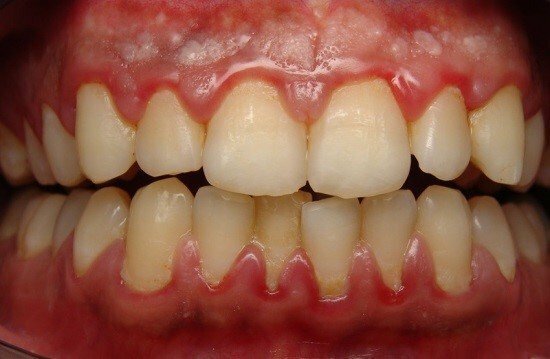 If left untreated gingivitis can develop into periodontitis. Periodontitis is a severe bacterial infection that destroys the gums, bone and ligaments supporting the teeth. Periodontal disease progresses silently, often without pain or symptoms and can lead to tooth loss. Dentists use several procedures to treat gum diseases. Non-surgical treatments focus on explaining to the patient the cause of the problem and motivating him/her to practice better oral health. This should be given special attention as it can be of utmost importance for the patient's future dental hygiene. Gingivitis is a marginal inflammation of the gingival. This can often be treated simply with a semi-annual dental cleaning to remove plaque, tartar and stains followed by good oral home care. Mild periodontitis is the next step of gum infection that comes after gingivitis. In this case, cleaning of teeth, scaling and root planning of infected teeth (a careful cleaning of the root surfaces to remove plaque and calculus from deep periodontal pockets) is performed. Periodontal surgery is necessary when severe periodontitis persists, after a non-surgical treatment has been performed. There are four types of surgical treatments: Pocket reduction procedures, regenerative procedures, crown lengthening, and soft tissue grafts.